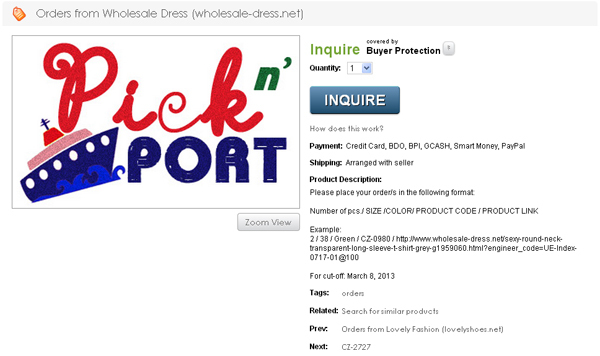 Pick N' Port is a new local online business that has recently been made known to me. What sets them apart from the hundreds of online shops we already have now is that you'll have a wider range of collections to choose from, because they are partnered with popular online wholesale suppliers: http://www.lovelyshoes.net and http://www.wholesale-dress.net. And if you're frequently window shopping online like me, then you've probably heard about those websites too. The reason I have never bought from online websites that run overseas is because I don't want to be bothered by dealing with the customs for duties and picking up my packages from the post office. For those of you who have done so, you know how trying it can be sometimes (or most of the time). In a nutshell, Pick N' Port aims to make shopping from their suppliers easier since they will be taking care of the shipping services from them to us. 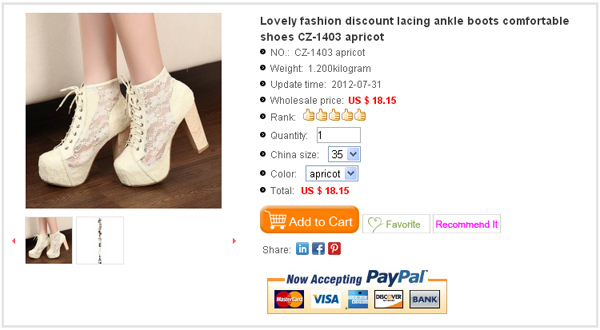 Go to http://www.lovelyshoes.net or http://www.wholesale-dress.net and pick out the items you want to order. Take note of the URL(s) of your choices. Go to http://picknport.multiply.com and click "Order Here". Click on which wholesale supplier you are ordering from. Send your inquiry with the details requested (see under 'Product Description'). And then wait for further instructions from Pick n' Port. It's really easy! If you're wondering about how the computation goes, you simply have to multiply the total price of your order by PhP 43 to get the equivalent in Pesos. You will find a more graphic explanation about the exchange rates and how to compute for your orders here. Of course, you can just ask them to do the computation for you if you aren't sure. It's going to be cheaper and more convenient than when you buy them from the wholesale websites yourself, because after ordering from the websites and paying for them, you'll still have to pay for duties when you claim your orders at the post office. Wholesalers and individuals can really benefit from this new business. This service is open only to Philippine residents.